The number of distinct pieces can be determined if we look for all combinations of paths for the hexagons and count how many colorings are possible for each path type. This is done for three colors in the picture below. For three colors out of four all numbers must be multiplied by four. Omitting some of the pieces you get the famous Tantrix Game. If you allow pathes of same color on the pieces you will get the wonderful Kaliko Game, which was first sold in 1970 and is now available from gamepuzzles.com. 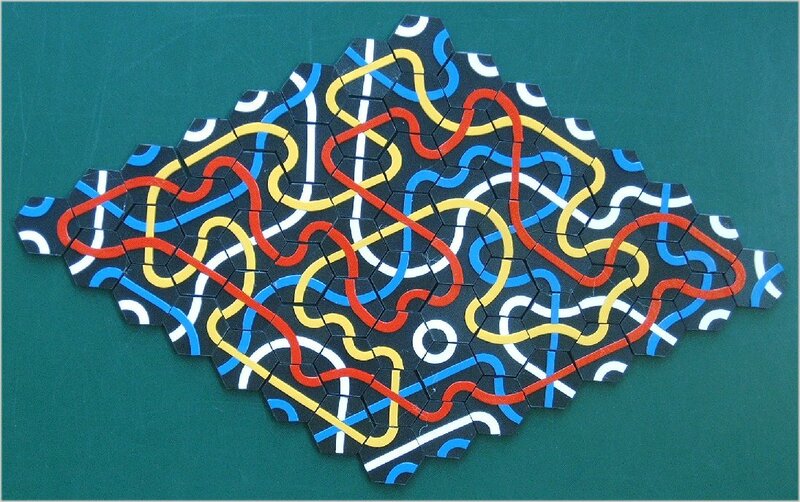 The set is small and in order to make one loop with all paths of one color the figure has to be rather compact.. The set using three out of four colors is four times as large and we can look for one or two loops connecting all paths of same color. Only sometimes such constructions are possible depending on the length of the border. As with the dominoes I made a set of plastic chips with little magnets on the back side to have a nonvirtual puzzle.